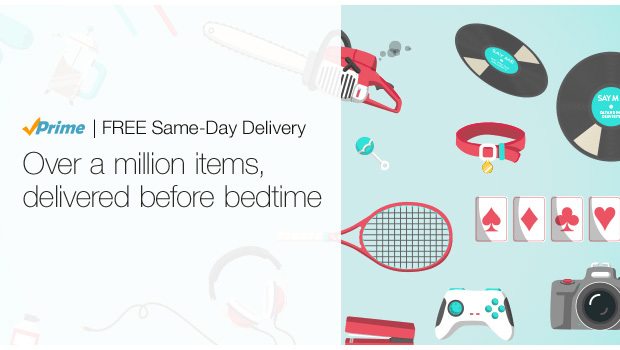 Amazon launched its new free same-day delivery option for Prime members Thursday. Available on a large, though limited, number of items in 14 major cities, the service promises delivery by 9 p.m., seven days a week. The service is only offered to those with a subscription to Amazon Prime, which costs $99 a year. A few other (small) caveats: Orders must be placed by the cutoff time, typically noon, and must total at least $35. For orders that don't meet the minimum price tag, Prime members can pay $5.99 for same-day delivery; the charge for non-members starts around $10. Over 1 million items will be available for free, same-day shipments, which is a fraction of the 20 million available in the U.S. for two-day deliveries, according to CNET. Currently available in Seattle, San Francisco, Los Angeles, San Diego, Phoenix, Dallas, Indianapolis, Boston, New York City, Philadelphia, Baltimore, Washington, D.C., Atlanta and Tampa Bay, day-of delivery builds on other efforts by the online retailer to get products into the hands of buyers as quickly as possible. It was already offering same-day arrivals in some cities (for the $5.99 fee) and 1-hour shipping in Manhattan for thousands of products, which now includes orders from local grocery stores.